Contaminated groundwater and surface water generally is associated with human-related activities such as illegal dumping of chemicals, over-application of agricultural chemicals, and improperly constructed or maintained septic systems. Yet natural chemicals, elements, or particles from the land and in the subsurface can affect the quality of fresh water, including its potability (drinkability). A contaminant may or may not be harmful to human health or the environment. Water that is safe to drink contains no contaminants at levels that may be harmful to health; however, it may still contain constituents classified as contaminants. "Pure" water does not occur in nature. The word "aesthetic" refers to what humans, via their senses, deem as satisfactory or desirable. Characteristics of water that are interpreted in terms of aesthetic preferences include hardness, color, taste, odor, and appearance. Water with reduced aesthetic quality may be described as "hard" (highly mineralized), colored, metallic-tasting, smelly, or cloudy. Aesthetic qualities and the natural constituents that influence them are summarized below. Natural factors can cause various colors in streams, lakes, and wetlands. 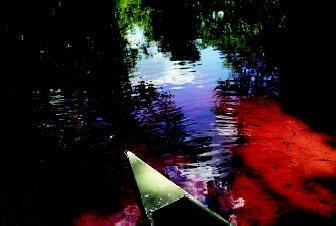 Algal and microbial activity, rather than any human intervention, turned the water red in this portion of Alexander Springs Creek in Ocala, Florida. Elevated concentrations of calcium (Ca) and magnesium (Mg) are derived from rocks and sediments in the subsurface. Limestone is made largely of calcium and magnesium and, as a result, groundwater that has been in contact with limestone will tend to have high hardness. Calcium and magnesium are common elements, however, and are contained in significant amounts in many rocks and sediments. If the water is in contact with these geologic materials long enough, and if the water is slightly acidic or corrosive, the water will contain elevated concentrations of calcium and magnesium, among other constituents. Perhaps the most common cause of coloration in groundwater is the occurrence of iron (Fe) or manganese (Mn) in the water. Red and brown colors are due to iron; black to manganese or organic matter; and yellow to dissolved organic matter such as tannins. Iron and manganese are common, at least in small amounts, in most rocks and sediments. In groundwater that contains abundant dissolved oxygen, iron and manganese form solid mineral phases and cannot be dissolved to any extent. In some groundwater, however, there is a limited amount or no oxygen present. Under that condition, iron and manganese dissolve in the water. When this water is pumped from the well, it encounters oxygen from the atmosphere, and these elements precipitate as very small particles of iron hydroxide and/or manganese hydroxide minerals. The yellow color associated with natural dissolved organic matter (e.g., tannins) may result when rainwater or runoff leaches this organic matter from leaves, roots, and other vegetative matter, and flushes it down to the aquifer supplying a well. The coloration both from iron and manganese and from dissolved organic carbon may occur seasonally. In streams, lakes, and ponds, color most commonly is caused by suspended sediments, algae, microbes, and organic debris. Water color may vary widely depending on the waterbody's biological, chemical, and physical characteristics. In addition to causing color, dissolved iron and manganese in groundwater and surface water may also impart a metallic taste to the water, even at low concentrations (e.g., less than 10 milligrams per liter). High concentrations (e.g., greater than 250 milligrams per liter) of dissolved minerals such as sodium, chloride, and sulfate tend to give the water a slightly salty or "mineral" taste. As with hardness, high total dissolved minerals (solids) results from groundwater that has been in contact with geologic materials at depth for a long time. In many areas, shallow groundwater may be acceptable in taste while deeper groundwater may be too salty for most human palates. Taste in some groundwater as well as in surface waters can further be influenced by the presence of microbes. The most common unpleasant odor associated with some groundwater is that resembling the smell of rotten eggs, produced by the presence of low levels of hydrogen sulfide (H 2 S) gas. This gas occurs when sulfate (SO 4 ) dissolved in water is transformed to H 2 S by bacteria in the presence of organic matter. The organic matter may be present as solid material or, more commonly, as dissolved organic carbon (DOC). Seasonal variations of the presence of H 2 S may result from periodic movement of DOC down to the aquifer during rainy periods. Additional odors may result from the presence of algal or bacterial growth in the well or in pipes and plumbing fixtures. Water in contact with these generally harmless bacteria may acquire a slightly moldy or musty odor. Water at the bottom of the well that has remained stagnant for a long time frequently has this characteristic. When this water is removed due to increased pumping, this odor may be noticed. The most common odor from surface water is associated with decaying organic matter. This is most likely to occur in surface water that is slow-moving and, because of high nutrient levels, experiences "blooms" of algae . When these organisms die and decay, they contribute to the stagnant odor of water. The decay of aquatic vegetation also can cause odors. Very small particulate matter that can remain suspended in water for long durations tend to produce a cloudy appearance, a characteristic known as turbidity. The turbid water may or may not have a distinct color. The particulates responsible for turbidity may originate from sediment (clay-size), microorganisms, or precipitation of mineral matter. Sediment naturally accumulates along the walls of the well and in the bottom. Under normal operations, the removal of water does not disturb this material. If pumping increases, or if water levels drop, this sediment may be disturbed and carried through the plumbing. Microorganisms may be moved in much the same manner. Sediment may also gain access to the well if the casing and casing seals are not functioning properly. There are other ways in which sediments in wells may be disturbed. Residents in the town of Scotts Mills, Oregon reported turbid water for several days after a magnitude 5.3 earthquake shook the community in March 1993, apparently disturbing sediment in the wells. As described above, iron and manganese may precipitate from water when it is exposed to air, leading to suspended particulates. Often, these particles will settle to the bottom of the container if left standing. Other minerals such as calcite (CaCO 3 ) may also precipitate, producing a light-colored or white-colored suspension. In streams, particulates generally are fine sediment (e.g., silt and clay), organisms, or organic material. Although nutrient loading can result in population explosions of organisms, the entrainment of sediment and organic debris often is associated with the stream's flow rate, itself a function of storm events and runoff. During storm events, runoff—whether from streets, parking lots, construction areas, farms, or logged forests—can carry larger amounts of particulates to streams. Some contaminants (e.g., metals and some pesticides) easily bind to these particulates, and as a result are transported within the water column. Microbes occur naturally in all waters. Bacteria, protozoa, viruses, helminths, and algae form a critical link in aquatic ecosystems, yet they also can pose a human health concern. These microbial constituents are described in "Algal Blooms in Fresh Water," "Human Health and Water," and three "Microbe" entries of this encyclopedia, and hence are not discussed here. The following discussion addresses common inorganic constituents. Chemicals of potential health concern that occur naturally in groundwater and in some surface water include arsenic (As), radon (Rn), selenium (Se), fluoride (F) and boron (B). Elevated natural concentrations of these chemicals result from a combination of natural geologic processes that tend to concentrate them, combined with a geochemical environment that allows the elements to transfer from rocks and minerals to water. Although associated with some forms of pollution, arsenic also occurs naturally in many parts of the world. Arsenic is most commonly found in areas characterized by volcanic rocks that are high in silica (e.g., rhyolite, volcanic ash, and sediments derived from these materials). Arsenic is not readily incorporated in the silicate minerals that make up igneous rocks; therefore, it tends to be concentrated in the last part of the magma (molten rock) that crystallizes. In rhyolite and volcanic ash, arsenic is found primarily in volcanic glass, a substance that easily weathers when exposed to the atmosphere or water. As a result, when groundwater encounters volcanic glass, it tends to chemically alter the glass and take arsenic into solution. Even if other humans did not exist, natural waters on the land surface (e.g., streams, lakes, or springs) often are unsafe to drink without treatment because they can contain natural contaminants, particularly disease-causing microbes from wildlife and other sources. Today's outdoor enthusiasts are taking an even greater risk than their ancestors because natural contaminants are joined by various organic and inorganic pollutants from ubiquitous human activity. How much arsenic is in the water depends on the available arsenic in the geologic materials, as well as the geochemical environment. Arsenic is most mobile in mildly reducing conditions, where iron is soluble and H 2 S (hydrogen sulfide) is not present. In January 2001, the U.S. Environmental Protection Agency changed the drinking-water standard for arsenic (i.e., the maximum concentration of arsenic in drinking water), reducing it from 50 to 10 parts per billion (ppb), or micrograms per liter. The standard is to become effective in 2006. This stricter standard is consistent with many other parts of the world, such as Europe, where the standard has been 10 ppb for some time. In areas of volcanic rocks in the western United States, groundwater can have arsenic concentrations ranging from 5 to 20 ppb, and in some cases exceeding 1,000 ppb. In the 1990s, elevated arsenic in shallow wells in West Bengal, India and Bangladesh were discovered, where over 25 percent of shallow domestic wells exceeded 50 ppb and ranged to more than 3,800 ppb. In many rural areas of these countries, sanitation is poor and surface water is heavily polluted. In an effort to provide safer drinking water, the governments installed tube wells in many areas. These wells consist of narrow steel or PVC (polyvinyl chloride) tubes that are driven into the ground. Although reducing the risk of illness as a result of microorganisms, the installation of tube wells inadvertently exposed a significant amount of the population, perhaps as many as 30 million individuals, to groundwater containing elevated arsenic concentrations. Elevated arsenic in groundwater also is found in other countries, including Argentina, Chile, Mexico, Taiwan, and Vietnam. Hence, this constituent remains a public health concern worldwide. Radon (Rn) is a radioactive gas that itself is a radioactive decay product of the uranium-238 decay series. There are several short-lived radon isotopes , but the one that is of health concern is 222 Rn, having a half-life of 3.8 days. As a noble gas , radon does not readily react with other elements and does not have a tendency to attach itself to mineral surfaces below the ground. Radon occurs naturally in groundwater that is in contact with sediments or rocks that contain uranium. These include rocks such as some shale, granite, rhyolite, volcanic ash, and sediments derived from these materials. As a gas, radon can migrate from the subsurface and may accumulate in buildings, particularly in basements and crawl-spaces. The risk of radon in indoor air depends on the composition of the subsurface geology, the permeability of the soils, and the type of building construction. Radon is a known human carcinogen that can reach people either through direct ingestion of radon-carrying groundwater or through inhalation of radon in the air. Although ingested radon may be harmful to sensitive cells within the stomach or other cells in the body that radon reaches via the bloodstream, the National Academy of Science in 1999 determined that the inhalation risk far exceeds that of direct ingestion. Of concern is the higher potential for lung cancer, particularly for smokers. Selenium, fluoride and boron occur naturally in some groundwater and may be potential health concerns in one form or another. Selenium is similar in its behavior to sulfur, whereas fluoride and boron are associated with rhyolites and granites. As in the case of radon and arsenic, these constituents are associated with geologic materials that are naturally enriched because of their mechanism of formation or because the chemical environment (e.g., redox conditions) is such that the elements are preferentially mobilized by groundwater. Although exceptions exist, the concentration of dissolved constituents in surface water almost always is lower than that in groundwater. This primarily is the result of dilution through tributaries and runoff, and because the opportunity for a given volume of water to dissolve minerals from the streambed is significantly lower owing to the reduced contact time that the stream water has with individual minerals comprising the streambed. As a result, concentrations of chemicals such as arsenic, selenium, fluoride, and boron will be low, even if those constituents are present in the streambed materials. As a gas, a contaminant such as radon will escape rapidly from stream waters and invariably will be present at only a low concentration. SEE ALSO Algal Blooms in Fresh Water ; Fresh Water, Natural Composition of ; Groundwater ; Human Health and Water ; Microbes in Groundwater ; Microbes in Lakes and Streams ; Pollution of Groundwater ; Pollution of Lakes and Streams ; Pollution Sources: Point and Nonpoint . Fetter, Charles W. Contaminant Hydrogeology. New York: Macmillan Publishing Co., 1992. Freeze, R. Allan, and John A. Cherry. Groundwater. Englewood Cliffs, NJ: Prentice Hall, 1979. The U.S. Geological Survey has determined the general distribution of radon potential for the United States (see <http://energy.cr.usgs.gov/radon/usrnpot.gif> ). On average, the higher potential of radon occurs in the upper regions of the United States from northeastern Washington to Maine, whereas the lowest potential occurs in the southeastern states. This is a generalized assessment, and does not mean that people living in a high-potential area necessarily are being exposed to elevated levels of radon. A citizen's guide to radon, describing the occurrence of radon, how to test for it, and how to take protective measures in the home is available on the U.S. Environmental Protection Agency's website at <http://www.epa.gov/iaq/radon/pubs/> . how maximum concentrate of manganese in surface water (river)? where? please tell me. it is very important. because in my City appearenced turbidity in water supply. they haven't found reasons. water supply has black and brown, they suggested that the reason is manganese and iron. they use river supplying water. How do I find out where there are naturally occurring high amounts of fluoride in the drinking water? I am primarily interested in Oregon and New Mexico. Thank you.